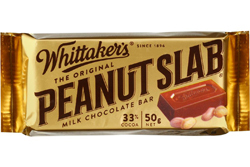 The original Whittaker’s Peanut Slab is as Kiwi as it gets! This 50g slab of creamy milk chocolate contains 33% cocoa, which surrounds carefully and deliciously roasted peanuts. Good honest chocolate! Might buy a whole box !